Antares is the name of the Pininfarina-designed photovoltaic station which furniture maker Metalco is presenting for the first time on the occasion of this week's MoTechEco in Rome, the sustainable mobility show being hosted in the premises of the Department of the Environment. The 33 sq.m. roofing consists of 20 photovoltaic panels of 230 Wp each, capable of producing total rated power of 4.6 kW. The tree geometry is designed to facilitate the transport and, above all, the assembly of the photovoltaic panels and so reduce the number of operators required, with a consequent overall energy saving. Antares is the name of the Pininfarina-designed photovoltaic station which furniture maker Metalco is presenting for the first time on the occasion of this week's MoTechEco in Rome, the sustainable mobility show being hosted in the premises of the Department of the Environment. 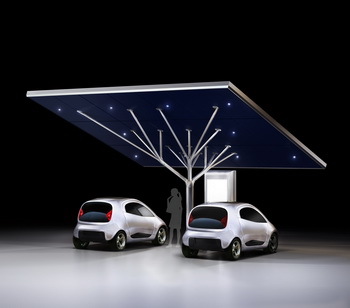 Equipped with a tree to hold the electric car charge point, the Antares station is being exhibited along with the Nido EV, a working electric prototype entirely designed and built by Pininfarina. Antares is the ideal, completely sustainable, solution for the parking and charging of electric cars, a system designed for company fleets and parking areas in towns: fuelled entirely through the photovoltaic cells lining the roof, the technology tree developed by Pininfarina Extra is designed to generate the energy necessary to cover the consumption of two cars averaging a daily 75 km. Metalco, a leader in the urban furniture market, has developed this first modular charging station (6700 mm x 4940 mm, minimum height 2380 mm) with an assembly of steel parts and aluminium connections. The 33 sq.m. roofing consists of 20 photovoltaic panels of 230 Wp each, capable of producing total rated power of 4.6 kW. The tree geometry is designed to facilitate the transport and, above all, the assembly of the photovoltaic panels and so reduce the number of operators required, with a consequent overall energy saving. Completing the station and guaranteeing the charging of electric cars is a technology tree that includes a bidirectional meter, a measuring unit for recording the energy produced and an inverter with electric inputs. The Antares project offers further testimony that Pininfarina’s commitment to sustainable mobility is total: not only the development and production of electric cars and research programmes investigating the reduction of consumption and emissions, the use of alternative, lighter and recyclable materials, active and passive safety, but also the design of the infrastructure that cities will need to provide if they are to sustain the spread of electric mobility. 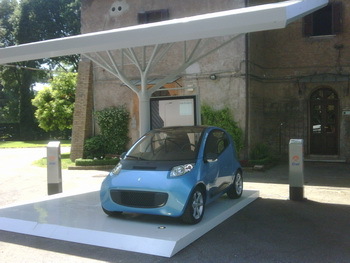 Being exhibited in the Aranciera Gardens under the Antares charging station is the Nido EV of 2010, an electric car entirely designed and built in the Pininfarina Style and Engineering Centre of Cambiano (Turin). A city car of limited dimensions (length 2905 mm), 2 seats and a permanent magnetic rear motor, the Nido EV is a veritable workshop whose aim was to explore the electrification of a small city car and, at the same time, to develop a modular floorpan. The structure is designed to be offered in four different electric or hybrid versions: 2 seater, 2+1, pickup and light van. Highlighting the engineering know-how accumulated by Pininfarina in many years of research, particularly in the development of hybrid and electric vehicles, just a few weeks ago at Auto Shanghai 2011 the company presented a mechanised, electrified Demo Vehicle this too developed in the context of the Nido workshop. This is a highly efficient modular structure with aluminium spaceframe and employs composite materials like carbon fibres and aramid honeycomb. A solution that makes it possible to design low production volume and low investment units, to make lighter vehicles and to obtain high dynamic stiffness for optimal driving and comfort. The structural lightness also makes it possible to employ batteries with lower energy capacity which are, therefore, lighter and less costly, while guaranteeing the same performance.